Appearance: Delvin has short wavy honey blonde hair, amber brown eyes, and lightly tanned white skin. His hair and eyebrows are thick, and he can often be seen with stubble, but cannot grow a beard. He tries to keep the stubble shaven but does not keep up with the task very well. Wears earthy colors usually and does not care much for fashion, so he can appear a bit rough around the edges. He does not see a bit of grime and dust on his clothes as a problem, so after working on blacksmithing projects or foraging he usually ends up rather unkempt and messy until he gets around to cleaning up on his own time, which he does not consider to be a very high priority. 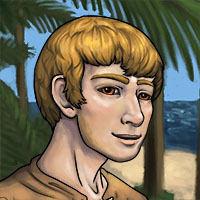 Delvin Brynmor is a young blacksmith with an adventuring spirit eager to carve out a niche for himself in a new land. Unsatisfied with merely honing his craft and working his way up in the ranks where he was trained in Syliras, he wants to be a useful member of a frontier land uncovering hidden mysteries and the like along the way. As a youth, he spent a considerable amount of time exploring the Bronze Woods with his father, who taught him the basics of forest survival. Though dedicated to his blacksmithing, he was always eager to explore the woods, fulfilling his need to satisfy his adventuring spirit. The thought of mysterious locales and traveling to lands unknown motivated him to choose Syka as a place to craft his future in. He has little experience in real combat, having trained in the use of shortswords as a hobby with sparring partners in Syliras, but he dreams of becoming strong enough to confidently fight true opponents and hone his skills in combat to become a powerful swordsman. Delvin has much to learn about the world, especially when it comes to dealing with people. He is a bit naïve and gullible, usually believing what others say even if it seems a bit unlikely, though he is not entirely stupid. A bit shy, he has not yet experienced as much of the diversity of thoughts, cultures, and appearances of Mizahar as a more seasoned adventurer would have. Coming from a rather large but not particularly wealthy family, he has grown up in the company of family members and a few friends who shared his hobby of adventuring in the Bronze Woods. There was no particular reason to grow distrust for others, and he never really strayed from his family and small social group when it came to interacting with others until now. His forays into the Bronze Woods led to him becoming familiar with the basics of foraging for edible plants, surviving in the wilderness for short periods of time, and finding his bearings in unknown territory. The wilds are a dangerous place for anyone, especially a novice such as himself, so he learned to always be cautious and not go deeper than was relatively safe for his skill level. Over time, he learned to venture deeper into the woods, but ultimately did not make it too far in, preferring to learn what he could from the safer outskirts where he could return to the city in a relatively short period of time should anything happen. He is fond of animals, but never had the chance to raise one of his own, instead enjoying to watch the wild creatures of the forest. Forest life - both plant and animal - was fascinating, boasting a beauty and volatility not found in the city, and inspired his desire to learn more of the outside world. House: Currently little more than a tarp laid out on the ground with a large tent set up on it, Delvin has plans to expand his humble home as he gets settled into Syka.